The first doctor to come to the scene where Oscar Pistorius shot Reeva Steenkamp testified on Thursday that the athlete was so emotional he feared he would turn the gun on himself. "I was afraid Oscar would hurt himself," radiologist Johan Stipp told the High Court in Pretoria where Pistorius earlier this week pleaded not guilty to premeditated murder. Stipp, who lives in the Silver Woods security estate where the shooting happened, said he was woken by gunshots and screams in the early hours of February 14 last year and after calling security went to his neighbour's house to see if anybody needed medical help. He found Pistorius kneeling next to his girlfriend with one hand on a bullet wound in her thigh and the other in her mouth, trying in vain to force her to breathe. Pistorius words to him were: "I shot her. I thought she was a burglar and I shot her." Describing the athlete's distress, he told the court: "He was praying. He was talking to God ... He was making promises to God, He was trying, maybe I don't know, to get atonement. "He looked sincere to me. He was crying, there were tears on his face. He was actively trying to assist her," he said under cross-examination from Pistorius's lawyer Barry Roux. Stipp said he felt for a pulse but it was soon clear to him that Steenkamp was beyond saving. "I opened her right eyelid. Her pupil was fixed, dilated and her cornea was already drying out. To me it was obvious that she was dying. I noticed blood in her hair and brain tissue mingled with that." In the first four days of the trial, the State has called four neighbours of Pistorius who testified that they heard loud voices coming from his house on the night of the shooting. This appears to support its argument -- dismissed by Pistorius as "unfair and incorrect" -- that the couple had a row before he shot Steenkamp. Like a married couple testified earlier this week, Stipp said he heard somebody cry out in mortal fear. "She sounded fearful. Of someone who was in fear of his or her life... She sounded to be emotional, anguished, scared almost scared out of her mind, I would say." In relentless cross-examination of the witnesses, Roux has repeatedly made two claims that are emerging as the corner stones of the defence. Firstly, he contends that they could not have heard Steenkamp scream because a head shot left her too severely brain damaged to make a sound. What they heard instead, he has repeatedly stated to those on the stand, was a shocked Pistorius scream for help in a high-pitched voice. Questioning Stipp, Roux said he would prove to the court that the disabled track star's voice rises when he is distraught. "I put to you that it does. Decibel tests were done." Secondly, the seasoned lawyer has repeatedly told witnesses that the sounds they thought were gunfire, were in fact made by a cricket bat bashing on wood as Pistorius broke down the toilet door into which he had fired his gun. Earlier on Thursday, Roux tried to cast doubt on the credibility of State witness Charl Johnson, whom he accused of tailoring his evidence to match that of his wife and incriminate Pistorius. He grilled Johnson about notes he had made after the shooting, and demanded to know why there were different drafts. It would suggest that the story was altered to suit his wife's, he said. "That is what it's all about," said Roux, theatrically waving a copy of Johnson's statement across the court room. The soft-spoken witness did not waver. "It's the nature of how I do my work," said Johnson, who is Afrikaans-speaking. I try to improve the quality of the work that I write... to use proper English and grammar." Afterwards, prosecutor Gerrie Nel moved to defend Johnson's credibility. 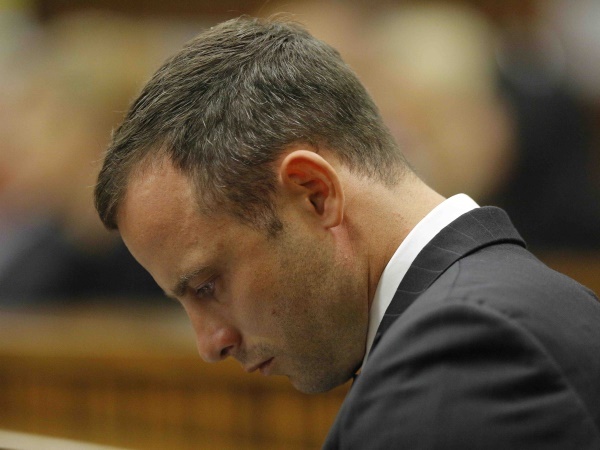 He used his re-examination to show that though the witness had heard during Pistorius's bail hearing that there were only four shots, he had not changed his statement to reflect this but kept to his original, more vague recollection. Pistorius is also charged with illegal possession of a firearm and ammunition, and two counts of discharging a firearm in public. The State on Wednesday called professional boxer Kevin Lerena to describe how Pistorius had made a friend take the blame after a gun went off in his hand in a restaurant in January last year. During Pistorius's bail hearing, Nel had honed in on this incident and suggested it showed Pistorius to be reluctant to take responsibility for his actions. Nel also at the time dismissed a contention that Pistorius's distress on night of the shooting showed he did not intend to kill Steenkamp. Remorse could have kicked in immediately, he argued.